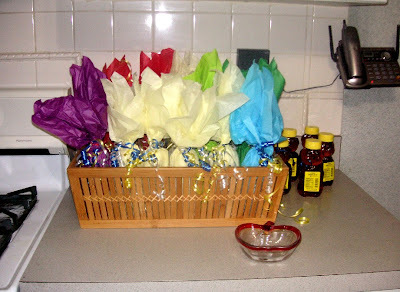 I often have cause to make a decorative closure for a large number of gift packages. This is the method I've developed for doing it quickly, using a minimum of curling ribbon and a minimum of frustration. I like doing it this way because I can prepare the ribbons in advance, allowing the packages to be assembled at the last minute, or opened and closed again without untying tiny knots. 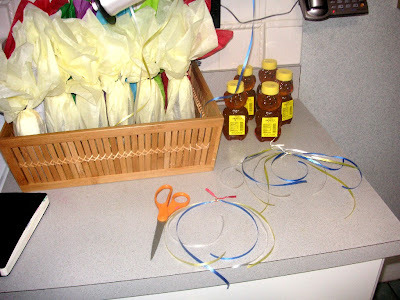 This is particularly useful for birthday party goodie bags, where the kids might make a project during the party. The project can be placed in the bag and the bag sealed in a decorative fashion at the end of the party. I also like this for packaging lollipops. A piece of plastic wrap secured by some curled ribbon around the stick makes a nice presentation, but it is aggravating to tie the ribbons around the stick, because the stick is so light. When we make chocolate lollipops, all the ribbons can be made while the chocolate cools. I like to use curling ribbon because it is easy to work with, inexpensive, and portable.. It is easy to keep many colors in stock since a large roll costs about $2. Choose a few colors of curling ribbon to use. Keeping the ribbons on the rolls (i.e. 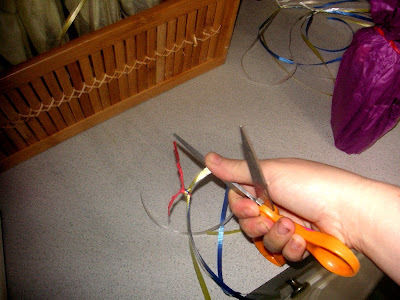 do not cut) pull a few feet of ribbon loose. Working with all the stands together make a slip knot about a foot from the ends of curling ribbon. 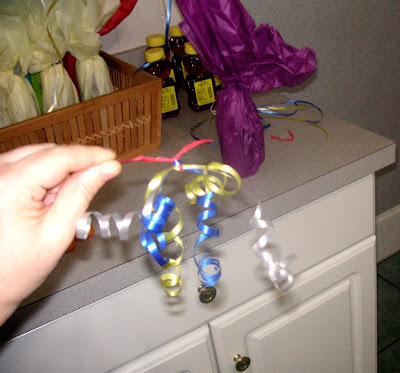 Take a twist-tie or bit of pipe cleaner and bend it in half. Slip through the loop of the ribbon slipknot and twist the ends of the twist tie to secure it to the ribbon. Pull the slip knot tight around the bend in the twisted twist-tie. Pull another two feet or so of the combined ribbon, and repeat the above steps with another twist-tie. Continue this way until all of the needed twist-ties are secured to the ribbon. 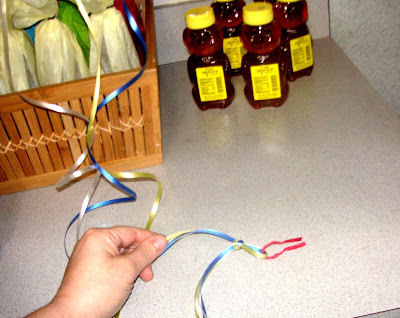 Cut the ribbons between the twist-ties to separate. There will be about one foot of ribbon on either side of each twist-tie. 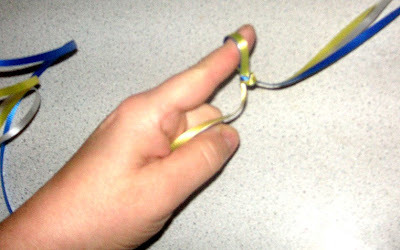 Using one blade of a scissors, curl the ribbon by pulling the scissors (away from your body along the ribbon's surface. If the ribbon is not curly enough the first time, run the sisters blade on the same side (i.e. top or bottom) of the curling ribbon again. If you run the blade first on the top and then on the bottom, the curling results will cancel each other. If you run them on the same side, the curliness will add/double. Attach the completed ribbons to the gifts, when the gifts are ready. For years, we gave the teachers at our children's school a honey dish at the beginning of the school year as token gift for the Jewish New Year (Rosh Hashanah). It was around then that I switched to giving honey bears, which have the advantage of being consumable so they don't add clutter to the teacher's lives. Had I not purchased our honey (in bulk cases from the restaurant supply store) earlier this summer, I'd strongly consider ordering some of these adorable Rosh Hashanah themed soaps, made by the even more adorable daughters of my friend, CruncyGranolaMom. Here's wishing all the readers of this blog, a happy, healthy, peaceful, prosperous, and sweet new (academic and/or Jewish) year. Wait. I don't get the advantage of leaving them all attached until right before curling. In fact, doesn't that make it difficult to make the slipknots after the first one? Or am I giving away my pathetic ignorance as to what a slipknot actually is? The idea is a great on which I hope I'll remember when the time comes. Btw, do you think of these things yourself or do you come across them in readings, conversations, etc.? I think it's easier to keep making slip knots and then reach for the scissors later. Switching tasks slows me down. The slip knot is just a loop in the middle of a line of ribbon with another loop from the same line pulled thorough it. Do you crochet? It's the first step in starting a line of crochet. You don't need the ends at all to make it. Hmmm. Let me look for a link that explains it better. I think if I were interviewing writers for hire, I'd ask them to describe a knot without pictures. Where do ideas come from? Um, everywhere, but mostly from necessity. I've tied many ribbons around lollipops in the past 15 or so years, cursing and dropping them, etc. When I get frustrated with something, I try to find solutions. I'm happy with any solution, it doesn't have to be original; it just has to work! I like to use what I have on hand, and I like things to be free if possible. You know that saying, "When the only tool you have is a hammer, you tend to see every problem as a nail"? 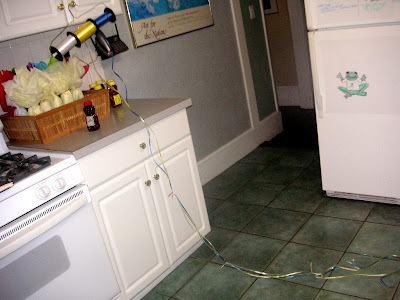 Well, I tend to see every problem as solvable with twist-ties, duct tape and yogurt containers. I just found three excellent (yet very different from one another) slip knot explanations. I linked them each to one of the mentions of "slip knot" in the original post. The third link (from the sailor) was particularly nifty, because you can easily decide which side to tighten. So thank you! I wouldn't have learned that if you hadn't asked!! No, thank you. I gotta tell you. I haven't blogged once since my move on August first and I miss it terribly. I have lots to say. But every time I have a few seconds to get on the 'puter, I compulsively have to look at your feed. I've never been so addicted. Well, that might not be true, but, you get the idea. Not that I actually do most of the stuff you talk about - I just wistfully fantasize myself as a GTD superwoman like, well, you! So enjoyable! I think I owe you (and all readers) a disclaimer/explanation, though: I'm not a GTD superwoman by any stretch of the imagination. I just like to share the stuff that works for me. The part of GTD and FlyLady that appeals to me is that they both take a systemic approach to everyday tasks. What I dislike is how easily their followers get caught up in a rigid adherence to someone else's system. I think we all need to cobble together custom-designed systems for our own particular situations. Reading about GTD, FlyLady, DIT, and all the other productivity systems is like studying Art History. It can be interesting and inspiring, even if you don't plan on creating your own painting, and will inform other endeavours. If you do decide to paint, it's not enough replicate the work of the Great Masters, you have to develop your own style. Thank you so much for the mention! A lovely lady called to order the other day and said she found us on your blog! Wow--thanks!!!! !